Friday October 15th 1881 It rained all day long. I worked and read. I do not feel very well have a severe cold. Charlie spent the evening with us. Saturday October 16th 1881. The weather was better today. I went down to take dinner and supper both with Chas and he spent the evening with us. 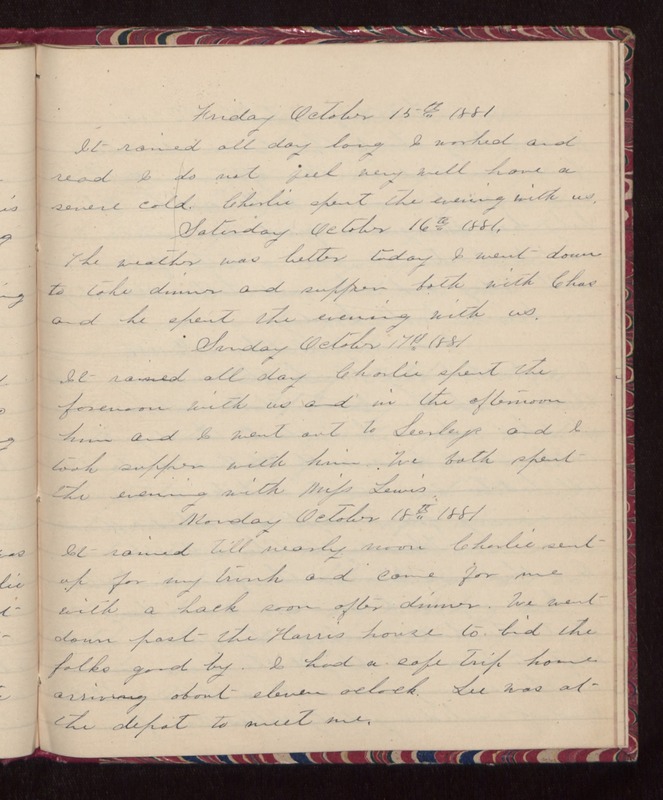 Sunday October 17th 1881 It rained all day Charlie spent the forenoon with us and in the afternoon him and I went out to Seerleys and I took supper with him. We both spent the evening with Miss Lewis Monday October 18th 1881 It rained till nearly noon. Charlie sent up for my trunk and came for me with a hack soon after dinner. We went down past the Harris house to bid the folks good by. I had a safe trip home arriving about eleven oclock. Lee was at the depot to meet me.